Antique curtain rods for tab top curtains, eyelet curtains or pinch pleat draperies. 8 foot Smooth 1 inch metal curtain rod. Wrought iron curtain rod look. Some colors are more than base price. Priced each. Double wall base drapery rod hardware, White finish. Clearance 1 1/4" to 4 1/2". Use with 94130. 94130-090: Ceiling brackets for estate ultra 2" decorative traverse rod. Eight foot reeded wooden curtain rod , 2 1/4" in diameter. Base price for unfinished, colors are more. See matching Finials, Brackets and Rings Priced each. Six foot reeded wooden curtain rod , 2 1/4" in diameter. Base price for unfinished, colors are more. Four foot reeded wooden curtain rod , 2 1/4" in diameter. Price based on unfinished, colors are more and will show in cart. 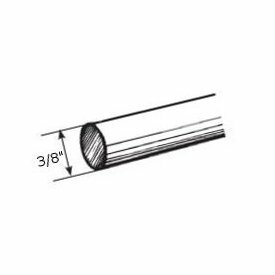 Select wood curtain rod pole 2 1/4" diameter, 16 feet long for extra long and wide windows. Available in 4,6,8 and 12 foot lengths. Ten colors to select from plus unfinished. Base Price is for unfinished rods. Colors will show price in the cart. Note: Truck shipping only. Select wood curtain rod pole 2 1/4" diameter, 4 feet long. Available in 4,6,8 and 12 foot lengths. Ten colors to select from plus unfinished. Base Price is for unfinished rods. Colors will show price in the cart. Note: 12' rods have to be shipped by truck. Select wood curtain rod pole 2 1/4" diameter, 8 feet long. Available in 4,6,8 and 12 foot lengths. Ten colors to select from plus unfinished. Base Price is for unfinished rods. Colors will show price in the cart. Note: 12' rods have to be shipped by truck. Custom Iron Collection sets include brackets, poles and a large selection of finial designs. Available in 1" and 1 1/2" diameter for all your windows up to 264 inches wide. Both the 1" and 1 1/2" can be ordered to your exact size and come in single, double and corner window configurations. By-pass and standard rings are available if needed for your design. An adjustable 1" rod set is available in three size ranges to cover windows up to 148" wide.